Now that the days are warming up, as we begin to make plans for a get together with our family and friends, dig out the barbeque grill and organise some food. The family pet will also look for an invite too, but we need to be aware that a BBQ can expose your dog to several hazards. If you really want your dog to be a part of your gathering, ensure that you follow some safety tips to make sure that everyone is protected during this barbecue season. Appliances can take time to cool down, therefore it is important to ensure dogs are not left unattended in the vicinity of a hot barbeque in case they jump up and burn themselves. Whether you are working with a gas grill or using charcoal to cook, be aware of the burn dangers. Of course, there is also the tempting smells that rise from the cooking meat, so for everyone’s safety, make sure your dog is kept indoors, or well away from the grill, as they won’t understand the risks. Keep matches, charcoal and BBQ lighter fluid well out of the reach of children and pets. Keep the food out of reach where possible. Familiarise yourselves with which foods are dangerous and ensure your guests are aware of the rules too. Foods that are high in fat can cause inflammation of the pancreas which is a serious and sometimes fatal disease. Corn on the cob isn’t easily digested by dogs, in the worst cases leading to a bowel obstruction, and they find this BBQ staple hard to resist especially when flavoured with butter or meat juices. One of the most common accidents involves dogs chewing and attempting to swallow kebab skewers whole, damaging their oesophagus, stomach and intestines in the process. 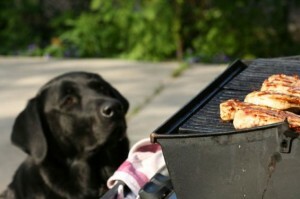 Other BBQ foods to keep away from your pets are garlic, onions, avocado, peaches and chocolate. Abandoned plates or those lying on low tables, containing tempting morsels of food need to be collected and disposed of before your dog reaches them first. Although not poisonous, if given to dogs these bones can shatter easily and are a choking hazard. Splinters from the bone can become lodged in or puncture your pet’s digestive tract. An emergency visit to the Vet will soon bring an end to your party! If a dog drinks alcohol, they can become sick very quickly. Provide cans or bottles for your guests, rather than glasses, to prevent your pet from drinking something they shouldn’t. Try not to leave any unattended containers of alcohol in the reach of your dog. Dogs will be spurred on by the delicious smells of the BBQ and may find reason to rummage in rubbish that is left around. Plastic plates, packaging, wrappers and any discarded food should be bagged up and stored out of reach. So what can your dog eat at the BBQ? Small portions of grilled fish or meat such as cooked salmon, chicken or steak. A small amount of hamburger won’t harm, but too much fatty meat can be a health hazard for your dog. Summer fruits like watermelon, with rind and seeds removed, or blueberries, are even nicer when frozen. Dogs love beef or chicken broth frozen in ice cube trays or try freezing carrots or green beans for variety. Just like humans, dogs who overdo the amount of food they eat may end up with a tummy ache the next day so be conscious of the quantities of food they eat at your BBQ. In the event of an injury, fear of a blockage or suspected poisoning a Vet should be contacted for medical advice. Does your dog love to play in water?